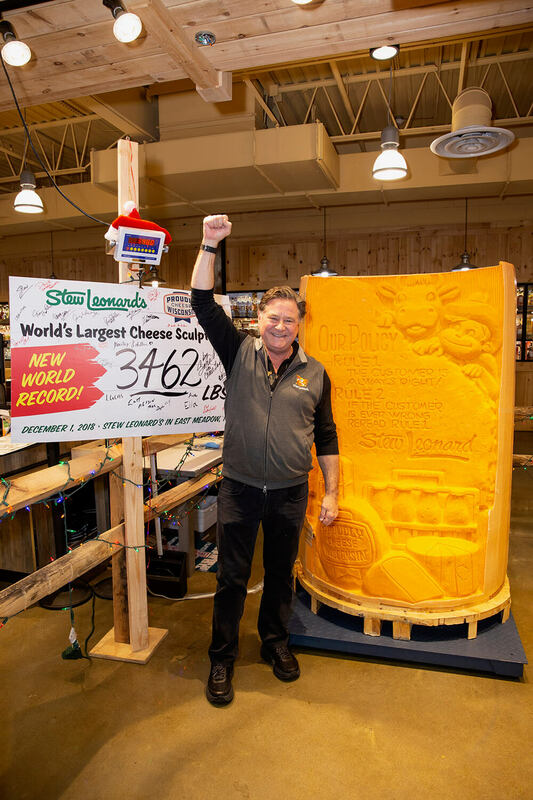 NORWALK, CONNECTICUT (December 10, 2018) – City of Norwalk Mayor Harry Rilling will join Stew Leonard, Jr., in unveiling the soon-to-be Guinness Book of World Records’ Largest Cheese Sculpture. The 3,462 lb. brick of cheddar will be on display for the first time in Connecticut, at Stew Leonard’s, Norwalk, located at 100 Westport Avenue, Norwalk, CT. The ginormous cheddar sculpture, shaped as Stew’s world-famous “Customer Service Rock of Commitment,” carved up the previous world record by nearly 2,000 lbs., and is being certified in the coming weeks by the Guinness Book of World Records. The big cheese was made with 4,000 gallons or an approximate 40,000 lbs. of milk. Over 500 cows contributed milk to this now-record-breaking cheese. The cheese originally weighed approximately 4,000 lbs., and was carved in East Meadow, Long Island. All visitors who come to see the cheese will receive a free grilled cheese, made with fresh-cut world-record medium cheddar!